Ella Saw the Tree, Robert Vescio (author), Cheri Hughes (illus. ), Big Sky Publishing, 2017. Synopsis: One windy day, as Ella plays in her backyard, she is showered by leaves. When she looks up, Ella sees a tree in her backyard … has it always been there? And why is it crying? It’s not until Ella carefully and attentively takes the time to – smell, listen, feel and look – that she discovers the tree in her backyard, as if for the very first time. By slowing down and experiencing new sensations, Ella learns to appreciate the simple things in life. Ella Saw the Tree is a beautifully illustrated and captivating story that show’s children how easy it is to appreciate the world. Review: While there are many fantastic funny, quirky picture books available these days that have kids laughing out loud, it is also important to give children a chance to pore over books which have many layers, and that they can take something new from on each reading. 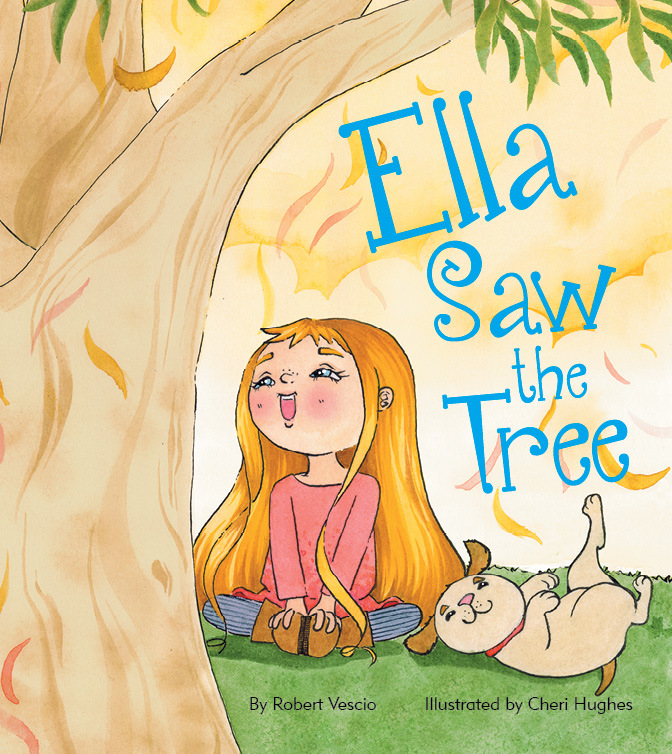 Ella Saw the Tree, written by Robert Vescio and illustrated by Cheri Hughes, is one such title. In the book, Ella is a busy child who enjoys spending time in her backyard, playing, swimming, bonding with her puppy, and using her imagination. However, when the large tree in her yard showers her with leaves, she discovers something new that has been right in front of her the whole time. Ella worries that the tree is upset because it is “crying leaves”, and doesn’t seem to be cheered up by her singing, dancing or funny faces, so Ella’s mother encourages her to practise mindfulness. By sitting still, breathing deeply and using all of her senses to notice and appreciate what is around her, Ella learns to bring her mind to the present moment and take in the world anew. She finds that the tree is not only beautiful, but also has many uses (e.g. it is home to a bird’s nest, and can be climbed and provide shade). Ella Saw the Tree introduces children to the concept of mindfulness and meditation in a sweet and effective way, and also highlights the importance of nature, and how much it can bring happiness, assistance and serenity to our lives. The book can also prompt discussions of the way in which the simple things in life, that don’t cost a lot, can bring hours of joy and entertainment. Vescio has peppered the story with lovely language throughout, including lots of alliteration, metaphors, action verbs and description. The soft-palette watercolour illustrations of artist Hughes captures the heart of the tale beautifully. Her whimsical and soulful style is a perfect pairing for the story of Ella’s learning and growth, and subtle backgrounds allow for the focus to be kept on the curious and vivacious main character. Ella Saw the Tree is suitable for children of all ages, due to its evergreen message, but is probably best for children aged around five years and up. A complimentary copy of this book was provided by the publisher in return for an honest review.